Mars rover Curiosity self portrait at the “Book Cliffs” in Gale Crater on Mars. Photo courtesy of the Planetary Society. 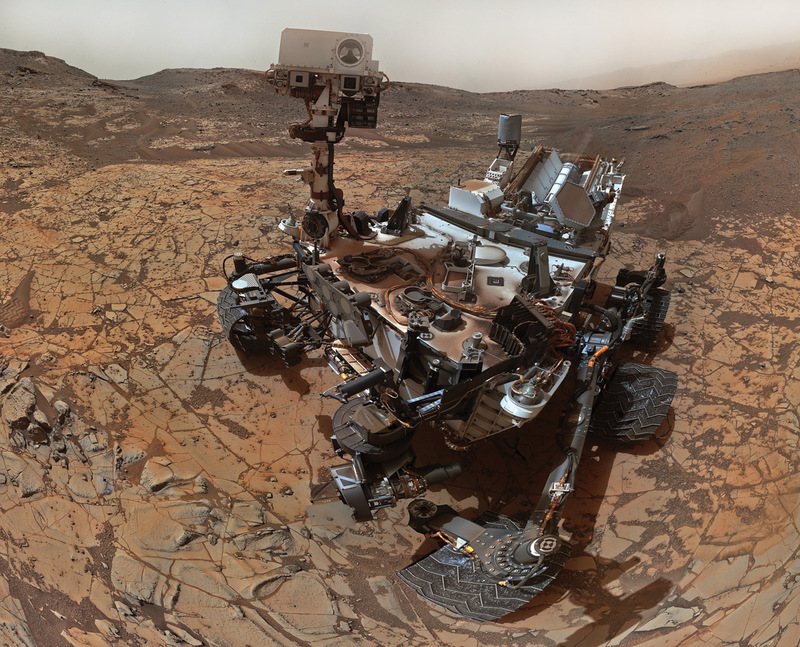 On August 5, 2012, NASA’s Mars rover Curiosity landed on the “Red Planet” to begin its scientific mission to study the fascinating geology of the 96-mile-wide Gale Crater and search for evidence of ancient environments capable of supporting microbial life. 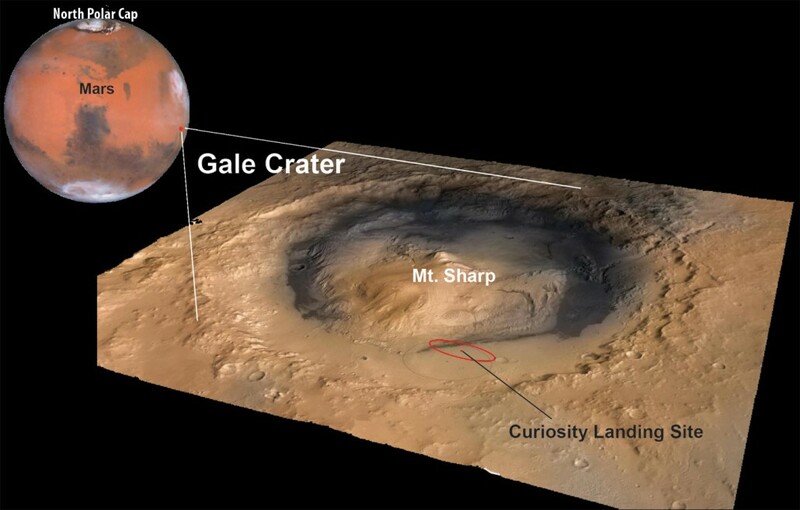 Gale Crater was chosen for the landing site because water was most likely present during various times since a meteorite created it 3.5 to 3.8 billion years ago. So far Curiosity has traveled over 6 miles photographing the terrain and taking close-ups of outcrops or significant rocks, analyzing rock samples for chemical and mineral content, and determining atmospheric conditions, on its sojourn from the landing site and up the flank of Mount Sharp—a huge mountain rising from the crater floor that exposes sedimentary (layered) rocks that are targeted for detailed study. Periodically, the Curiosity science team compiles lists of potential names for to use for rock targets and locations observed by Curiosity along its trek. These informal names differ from the formal names for major features designated by the International Astronomical Union (IAU). The rover science team’s convention is to take names from Earth places and (ideally) geologic formations or features, and assign them to Mars features in each 1.5-kilometer quadrangle the rover drives through. The current theme for the Shoshone quadrangle on Mars that the rover entered on June 23, 2014, is from the southwest United States. Utah’s spectacular cliffs, canyons, mountains, and world-famous rock formations have provided the Curiosity team with a plethora of names to use—nearly 40 applied to Curiosity sites and rocks to date. Many of these Utah names selected now show up on photos and descriptions on the mission website (http://mars.jpl.nasa.gov/msl/mission/overview/), blogs, press releases, etc. They will later appear in planetary journal papers and as parts of various scientific presentations. Many of the Utah names now applied to Martian rocks, outcrops, and locations are very familiar to those of us from the state, or tourists and geologists who have visited the incredible geology at our many beautiful national and state parks. 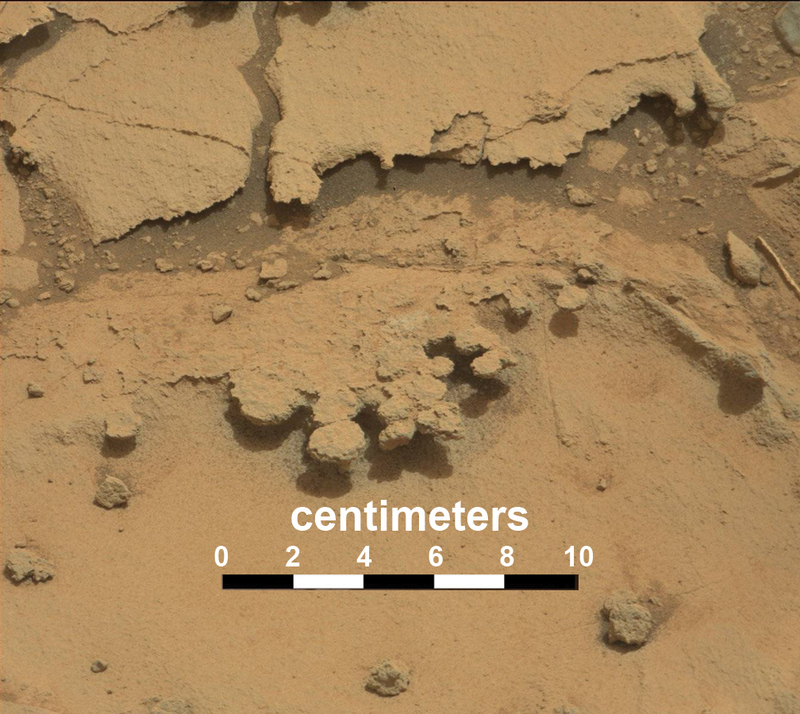 Some Mars features look very similar to Utah geosites or rocks, whereas others are similar in name only. Below are some examples from the Mars Curiosity mission through Gale Crater, and their Utah namesakes. The Martian Pink Cliffs comprise a small ridge about 3 feet long and 6 inches high. This sandstone ridge appears more resistant to erosion than the surrounding flatter terrain. The rocks in this region are heavily fractured and sculpted by wind erosion. The rover team had Curiosity drill a test hole at this site. In Utah, the Pink Cliffs are the top “step” in the Grand Staircase, a series of prominent, east-west-trending cliffs which ascend from the rim of the Grand Canyon to the High Plateaus of southern Utah. The Pink Cliffs are composed of the Eocene-age (55 million years old) Claron Formation and consist of siltstone, sandstone, and conglomerate deposited in river, deltaic, and lake environments. 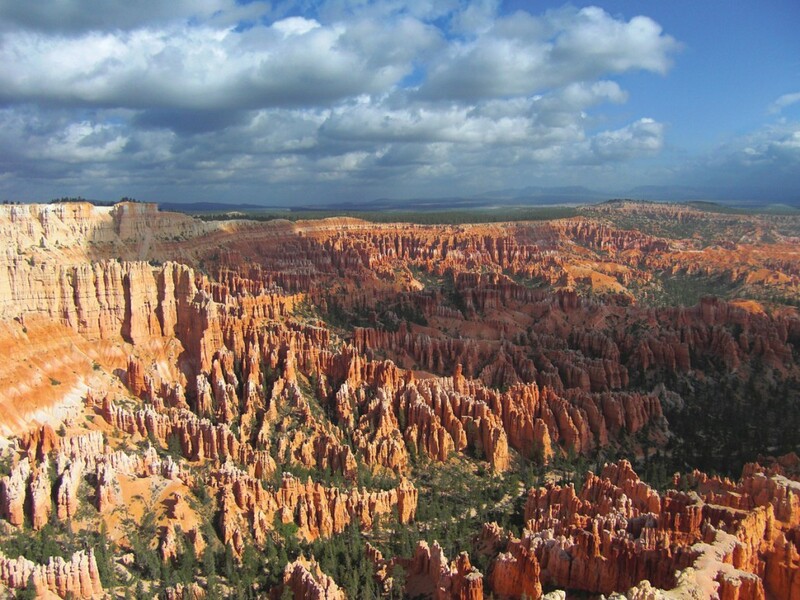 Erosion has sculpted the Claron into the spectacular hoodoos at Bryce Canyon National Park and Cedar Breaks National Monument along the Pink Cliffs. With its humpback form, Whale Rock is one of the more prominent outcrops in Mars’ Pahrump Hills region. 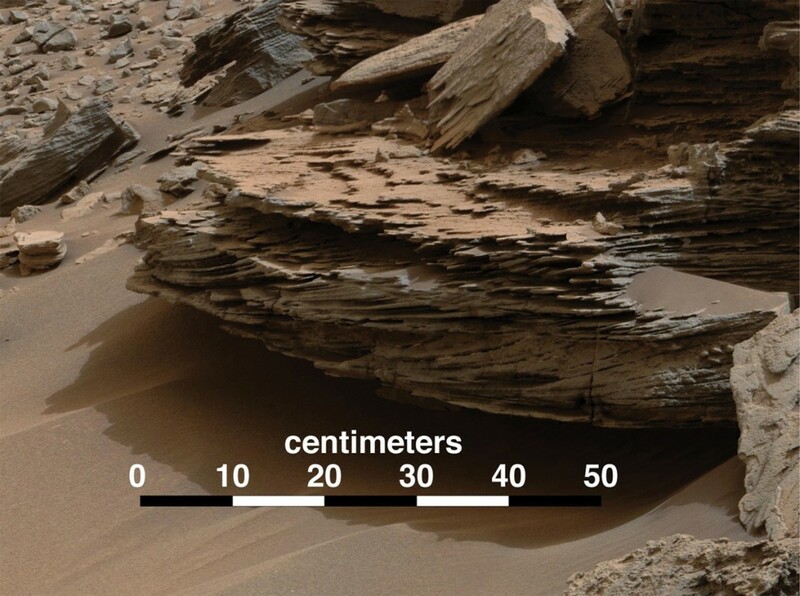 This beautifully cross-bedded Martian sandstone has small “climbing” ripples, a sedimentary structure that forms in conditions of rapid deposition. These features possibly represent river-transported sediment that underwent rapid deceleration as it entered into a lake basin, creating a delta deposit. Cross-beds are key paleoflow-direction indicators, and at Whale Rock the current direction was to the southeast (left in image). Utah’s Whale Rock is located in the Island in the Sky district of Canyonlands National Park. 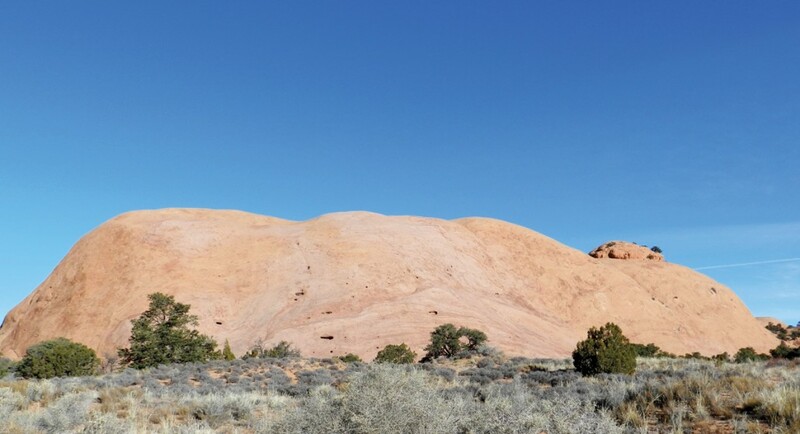 It is a large, eroded and rounded outcrop of Jurassic-age (about 190 million years old) Navajo Sandstone (composed of wind dune sands deposited in an ancient Sahara-like desert) that looks like, as its name suggests, a large whale. Cross-beds indicate paleowind directions were from the north and north-northwest. A fascinating ledge outcrop with connected circular disks called Hayden Peak generated a lot of discussion among the Curiosity science team. Wind erosion probably scoured the softer rock beneath these discs, resulting in the outcrop perched above the ground where it casts shadows. The cause for the disk form is still unknown, but one hypothesis is that this is a variation on the spherical concretions (“blueberries”) observed by the Opportunity rover. Utah’s Hayden Peak is a 12,479-foot mountain in the western part of the Uinta Mountains. It is composed of faulted and gently north-dipping sandstone beds of the Proterozoic (800 million years old) Uinta Mountain Group. 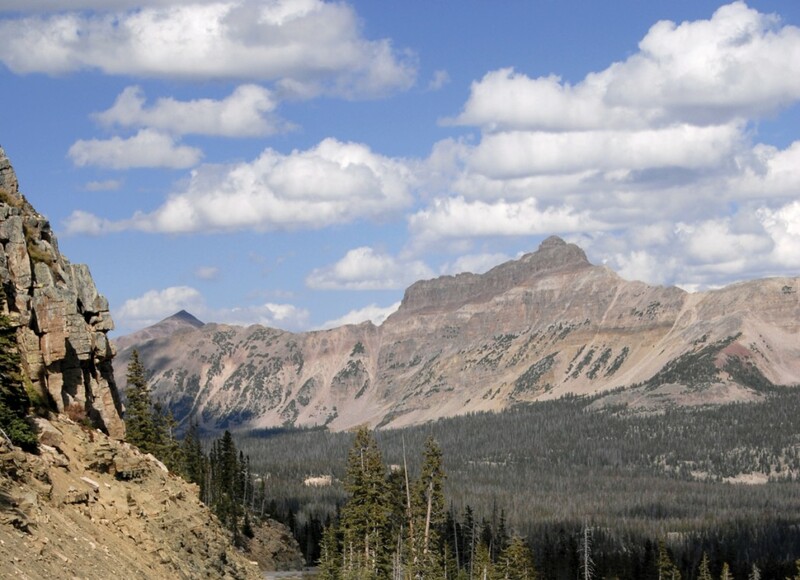 The Uinta Mountains were uplifted 70 to 38 million years ago during the Laramide mountain-building event. Hayden Peak was later carved by the forces of running water and further shaped by glaciers during the Ice Age about 16,000 years ago. 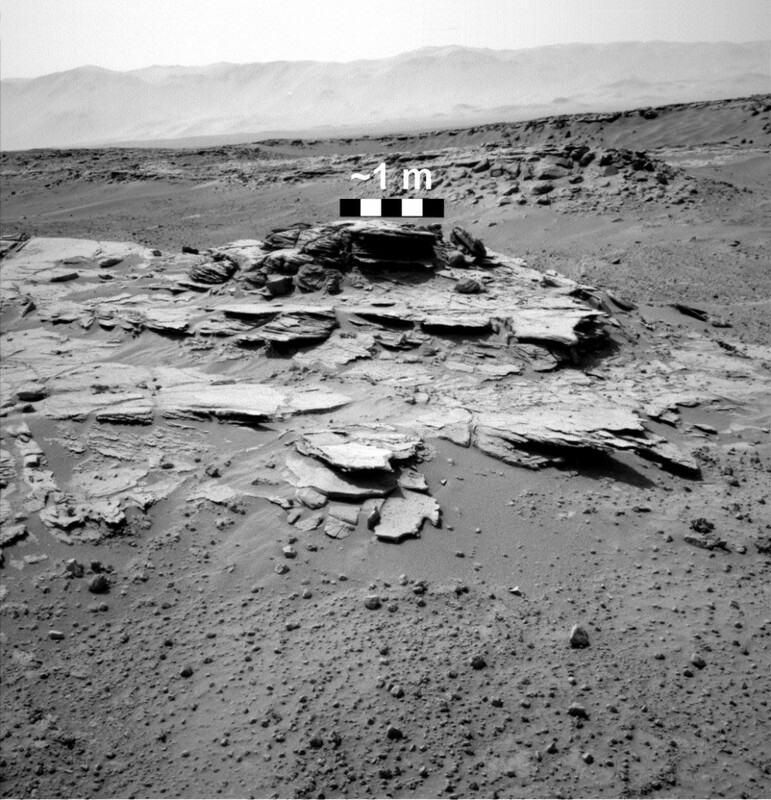 Although Curiosity is outfitted with three color cameras, which capture the Martian terrain at a range of scales from landscape (wide-angle and narrow-angle cameras on the rover mast) down to that of a geologist’s hand lens (MAHLI instrument), occasionally the black-and-white navigation camera (Navcam) images of the terrain evoke the artistry of the likes of Ansel Adams. A spectacular outcrop of cross-bedded sandstone forms Upheaval Dome. Cross-beds form where sand is transported in a current of wind or water, making sand ripples. Sand cascades down the slip faces (leeward side) of the ripples, building a series of inclined rock layers. The Upheaval Dome deposit is interpreted as a relic sand dune. Utah’s Upheaval Dome is a large, circular structure also located in the Island in the Sky district of Canyonlands National Park, just west of Whale Rock. Rocks as old as Triassic (about 250 million years old) are exposed in its core and are surrounded by concentric rings of younger Jurassic rocks. 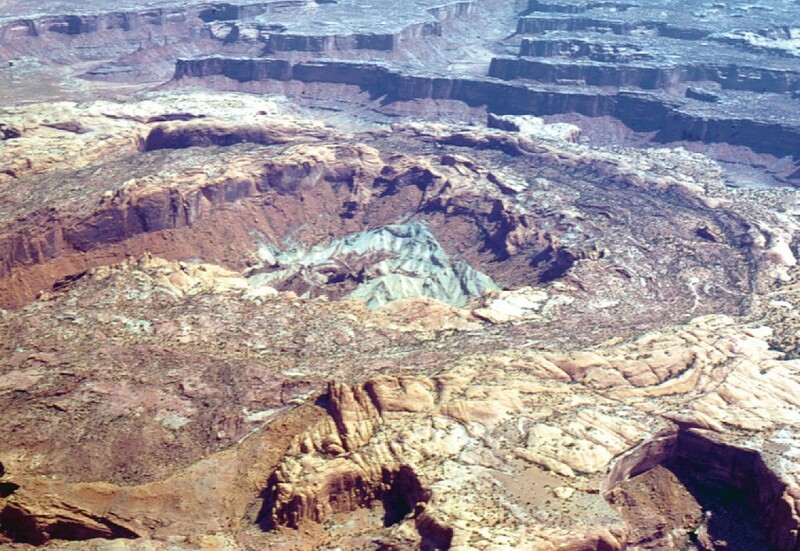 The origin of Utah’s Upheaval Dome has been debated for years by both planetary and petroleum geologists. Some argue it was created by a meteor impact while others compare it to Gulf Coast salt domes (which are major traps for oil and gas) where deep salt deposits under pressure have flowed upward like toothpaste, bending and piercing the overlying rocks. The Mars Curiosity mission is a triumphant engineering and scientific achievement that hopefully will continue for several more years. The images and data collected by the rover in Gale Crater and on Mount Sharp have already led to significant discoveries that will enhance our understanding of Mars’ geologic history and perhaps that of our own planet. Studying this wealth of information promises to keep geologists busy well into the future. Planetary geologists also come to Utah to conduct research into landforms, rock types, and geologic processes that are analogous to those on Mars, such as ancient exhumed river channels (see Survey Notes, v. 40, no. 3) or iron concretions (often referred to as “Moqui marbles”) that formed the same way the Mars “blueberries” did that were discovered by the rover Opportunity in 2004. Thus, Utah geology in a small way is continuing to help with the study of Mars, the planet most similar to our own, both geologically and now with providing great names!